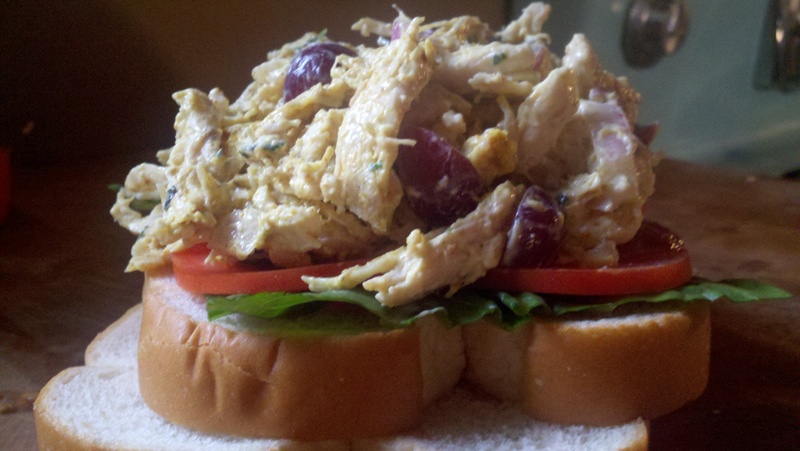 I stole this idea for chicken salad from The Food Network’s, Ellie Krieger. Her style of cooking focuses on heathy and natural foods. She has quite a few recipes that I love. In her curried chicken salad recipe she uses Greek Yogurt which adds a nice flavor and also cuts the calories significantly. I used good ole fashioned mayonnaise in mine (and changed around a few other things.) Depending on the health factor you’re going for you could use the yogurt, mayo, reduced fat mayo, sour cream, or even just plain olive oil. Either way the combo of the curry, grapes, and cilantro is amazing! Thanks Ellie! Grill chicken or cook on stovetop. Let cool, then shred chicken breasts into pieces by pulling apart with 2 forks. Combine with the rest of the ingredients and let chill. Serve over greens or make sandwiches. Makes about 4 sandwiches.